Will your class escape in time? 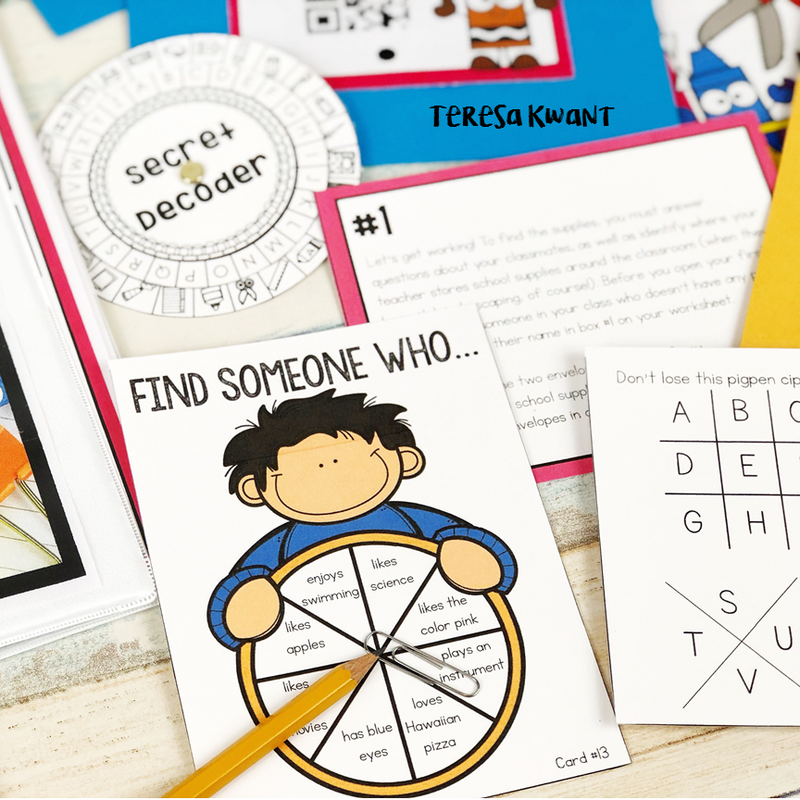 Try this escape room style game with your students today! 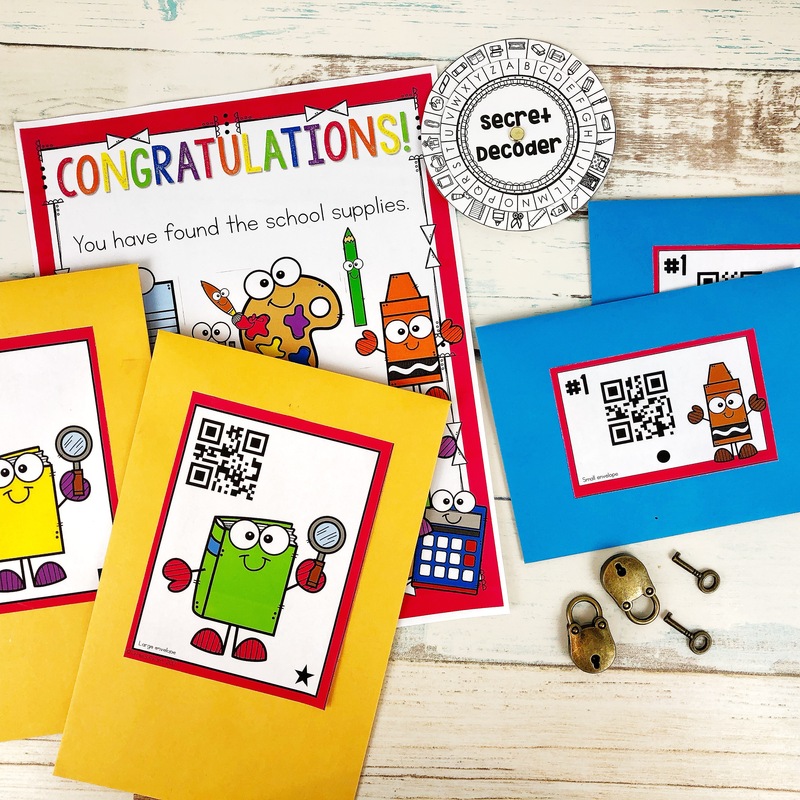 This is a fun game that is perfect for the back to school season. This game focuses on students getting to know each other. It is similar to a “Find Someone Who” game, but an escape room version. This activity is great for the first day of school, team building activities, and for students just getting to know each other! It is perfect for students in grades 3-6. The school supplies have come to life and are running away! If students don’t find them, they won’t have enough supplies for the year. Not only will students be learning about their classmates, they will also be learning about where different school supplies are located in the classroom. They must solve a string of “find someone who” questions and clues, as well as decode different ciphers. If your class has never played an escape style game before, I suggest playing this as a whole class. However, materials are provided for up to 6 different groups to play at one time. The games comes in color, and black and white. This is an interactive game where the students are timed. Students try and solve clues and questions to breakout and escape the classroom. You the teacher, can decide how much time your students have to complete the task. I suggest 45 minutes, but it is up to your discretion. You can project a timer for your class, or put one somewhere for all the students to see, so they can keep track of how much time they have left to complete their task. I have enjoyed this product. my students and I loved this! 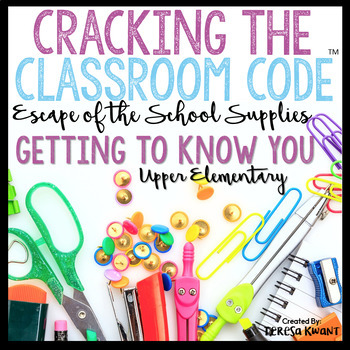 Great way to get to know the kiddos and intro escape rooms! Kids were involved and engaged! Fun beginning of the year activity! My kids love escape rooms! It seems like a lot of prep work, but excited to do this the 1st week back! My students loved these! Thank you! 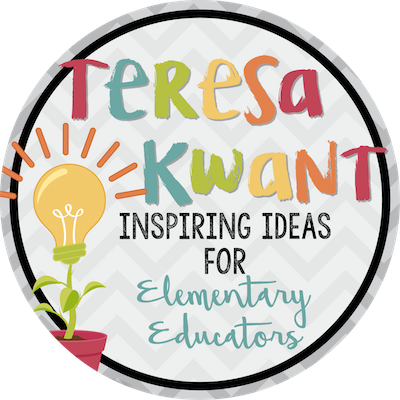 Love these resources! The students enjoy them and they are not too much work to put together…..
Great product! The directions are very clear and thorough. I can’t wait to use with my 5th graders! I am sure my 4th and 5th graders will love this! Can’t wait to try it out! Our school PBSIS team purchased licenses to use for our first week of school! I can’t wait to have our whole school participate in these! I am planning on using this next week with my students. I’m still looking through it, but it looks like an awesome way to start the year! Just like your alien abduction product, this kept my kids entertained and getting to know each other. I love the creativity to put a twist on the typical get to know you activities. Thanks! Can’t wait to use it! Even though there is quite a bit of prep work requires, the students absolutely LOVED participating in Cracking the Classroom Code! I can’t wait to do this with my students. The start of a new year, means it’s time for a new activity as well! My students last year LOVED these! Thank you! Really great, my students love these! One suggestion would be to note which pages to print. Great way to break the monotony of dealing with school supplies on the first day of school! Allow yourself plenty of time to prep the activity ahead of time. This is my first year in 5th grade. I was looking for something special to do the first week of school. This is perfect! I look forward to trying it out and getting student input. Thanks! My students loved the alien one, can’t wait to use this one! It was a little confusing for me to set up, but good quality. So fun! My kids will love this! Thanks! What a fun way to start the year! I think this will be a great way to start this school year! I can’t wait to use this in September! This is going to be a great class builder for the first week of school! This is such a fun way to start the year! Excited to use this the first few days of school! So excited to use this at the beginning of this school year. Thanks! So cute! Can’t wait to use this at the beginning of the year! The kids are going to love it! So excited to try this with my class. I can’t imagine them not being excited. If so we will try some of your others. Excited to try this! I know my students will love it! Have not used this quite yet, but just reading it…. I love it! I cannot wait to use this! Can’t wait to use this fall! After reviewing and preparing this activity, I can’t wait to do this with my class this fall! Another product my kiddos just loved! 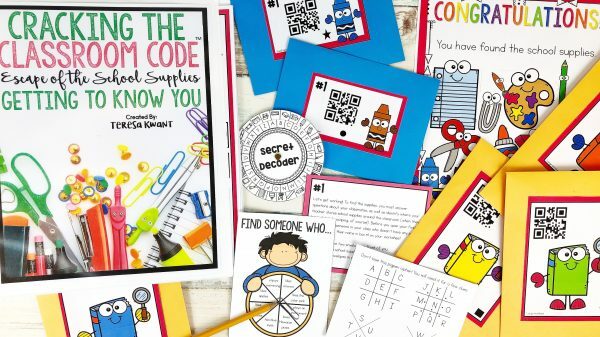 In the past my kiddos have LOVED cracking the code activities. I’m excited to begin the year with this one. Another great escape room….keep them coming….